This article is a step by step breakdown on how to set the minimum hours required before pickup when booking online. 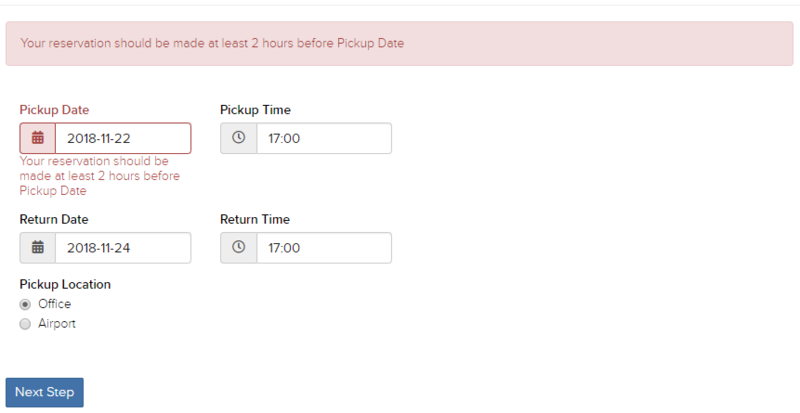 When you do this, the iFrame will not allow your customer to go to the next step if the time is less than the number you set with the current time. To learn where you can get your iFrame link, follow this link here. Firstly, navigate to Setting > Car Rental as shown in the picture below highlighted in dark blue. Next, navigate to the “Advanced” section. Here, under “Minimum Hours Required Before Pickup when Booking Online”, key in the number of hours that you want. By default, the minimum hours is set to 2 as seen in the picture below highlighted in orange. Now when a customer starts a reservation, they will not be able to go to the next step as shown in the picture below.